Daytona Beach, Fla. – November 19, 2018 – Adding to its current collection of metal frames, Costa Sunglasses® is launching new metal styles with enhanced performance features including ultra-strong, lightweight titanium frames with castor seed Bio-Resin and Hydrolite® temple tips. The new metals are among the lightest titanium frames on the market and will be available in retail in early November. The four new unisex metal frames come in various sizes and include over-injected and adjustable temple tips; air-cushion, full-motion nose pads; textured rubber temple pads for grip; and internal spring hinges for added performance and comfort. The new styles are available with Costa’s 580® polycarbonate lenses in various color options including gray, blue mirror, gray silver mirror, green mirror, copper silver mirror and sunrise silver mirror. The Turret, the smallest and lightest of the new metal frames, weighing in at 9.47 grams, is a medium frame with a full rim. It comes in three frame colors including matte black, matte dark gunmetal and matte silver. Each frame color features a coordinating temple tip, rubber and logo color ranging from deep blue and matte black to gray and orange—offering a pop of color in just the right dose. Helo weighs only 9.78 grams, offers a large fit with back-chassis, giving the frame a rimless look with the strength of a top bar, and is proving popular with both men and women. The three featured colors in this frame style include matte black with matte black temples and black rubber, matte champagne with deep blue temples and turquoise rubber, and matte silver with translucent gray temples and orange rubber. The Skimmer (9.48 grams) and Pilothouse (10.91 grams) frames are the largest of the new metals providing an extra-large fit. Each comes in two color options: matte black with black temples and black rubber, Skimmer is also available in matte silver with matte dark translucent gray temples and orange rubber, and the Pilothouse style also comes in matte dark gunmetal with deep blue temples and black rubber. The new performance metals feature Costa’s 580 color-enhancing lens technology, which provides 100 percent UV protection and polarization, delivering the clearest lenses on the planet. Costa’s 580 lenses selectively filter out harsh yellow light for superior contrast and definition and absorb high-energy blue light to cut haze and enhance sharpness. Costa’s new metal styles range in price from $219 to $239, based on frame style, color and lens selection. 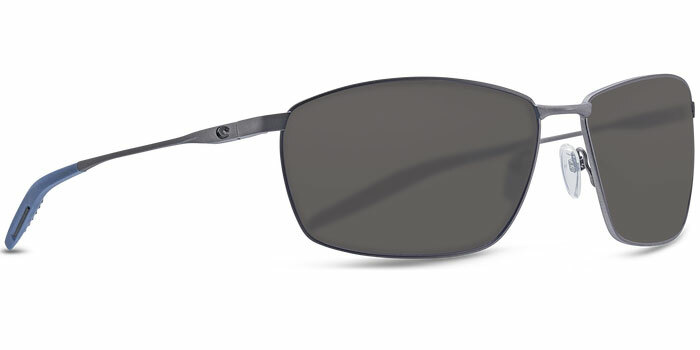 For more information on the new frames and Costa’s full line of performance sunglasses, visitwww.costasunglasses.com.